Our Love Affair with the Classics! Whether they’re books, cars, clothing, movies, music, they all speak to us in some deeply satisfying, nurturing way. They’ve withstood the test of time and in their own way have become Timeless. 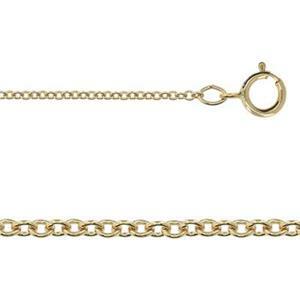 Our 3133020 – 14/20 Yellow Gold-Filled 1.3mm Heavy Cable Chain with Spring Ring. 20-Inch - or Matinee Length, perfect for wearing with a high collar. Perfect for mixing Business with Pleasure in your attire! Add a Gold-Filled Charm to add some Dramatic Light-Reflecting Interest. Cable Chains. A Definite Classic. These 14k gold filled chains are very well made and will hold a heavier pendant. Plus the gold is brighter and they look fantastic. Very pleased with this top quality item for my jewelry pieces. Thank you!